Posted on September 26, 2014 March 4, 2015 by Sarah R.
The third in The New School’s Politics of Digital Culture Conference Series Sponsored by The New School and The Institute for Distributed Creativity. Nov 14-16. 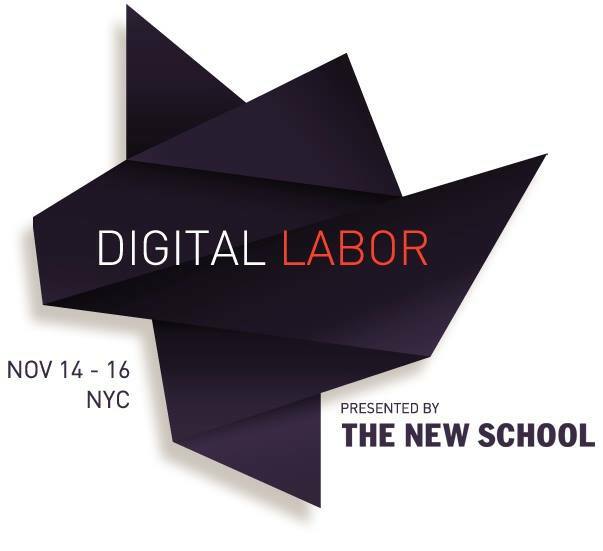 The third in a series of conferences focused on digital labor will take place from November 14-16 in New York City. The event is open to to all and registration is free. Trebor Scholz, the visionary behind the series, shared the following words about his hopes for this fall’s conference, which I have reprinted below. My vision for #DL14 can be located somewhere between the opening sequence of Chris Marker’s “A Grin Without A Cat” and Jason Reitman’s “Up in the Air.” Or, perhaps the other way around. It’s about 21st-century labor: the shift away from employment toward contingent work through Uber, TaskRabbit, 99Designs, and Amazon.com’s Mechanical Turk. How large is this workforce and which emerging forms of solidarity can we envision? #DL14 questions the ability of traditional unions to protect the ever-larger contingent workforce. And it is about our imagination of novel associations and forms of mutual aid. #DL14 is also about the crooked language that is used to describe emerging forms of work through the lens of flexibility, sharing, self-reliance, and autonomy. And it centers on workers who get together in any way possible, who form their own cooperatives, and who learn from the encouraging developments in the fast food industry, at Walmart, Occupy, and the domestic labor, and taxi associations. The ultimate goal of #DL14 is to shape new concepts and theories as they relate to, for example, guaranteed basic income, wage theft, and shorter work hours. We also hope to look through the vast landscape of digital labor and identify work practices that are worth supporting. #DL14 is not solely about radical critique; it is also, simultaneously, about alternatives. In that vein, we hope to establish an advocacy group for the poorest and most exploited workers in the digital economy. Why did Tim Berners-Lee’s Magna Carta for the web ignore the fact that millions of people wake up every day to “go to work” online? Why has the Electronic Frontier Foundation still not taken up digital work? This isn’t merely an academic event because this discourse has not only been shaped in universities. Philosophers, artists, sociologists, designers, toolmakers, activists, MTurk workers, journalists, legal scholars, and labor historians … all co-shaped the ongoing debate about digital work. This is a conversation that also calls for legal scholars to reconsider the definition of employment and the much-debated statutory difference between an employee and an independent contractor. A difference, I might add, that is deeply consequential as independent contractors are stripped of their rights as workers. #DL14 will give a voice to startups that decided to put in place fair labor conditions. We will, for example, hear from one crowdsourcing upstart that decided to implement a minimum wage floor for their contractors. At #DL14, you will not only hear from workers at UPS and fast food restaurants, you will not only meet farmworkers, taxi drivers, and Mechanical Turk workers; #DL14 will also bring these workers together with computer engineers and other technologists to think through possibilities for worker organization. #DL14 is set against the background of a blistering social vision of economic inequality. 4 in 10 working Americans earned less than $20,000 in 2012. Almost half of all Americans are economically insecure today; they cannot afford basic needs like housing, childcare, food, healthcare, utilities, and other essentials. The restructuring of the economy away from employment, moving in the direction of contingent work, insidiously circumvents worker rights, in a way that is arguably more damaging than what Reagan and Thatcher did it to miners and flight traffic controllers in the 1980s. This restructuring creates facts on the ground that are an affront to over one hundred years of labor struggles for the 8 hour workday, employer-covered health insurance, minimum wage, the abolition of child labor, workplace harassment, and other protections that had been established through the New Deal to foster social harmony and keep class warfare at bay. What you can see here is a slight shift from the focus of the exchange that we had five years ago. Since then, there has been a proliferation of publications, artworks, conferences, tools, and workgroups, syllabi, and exhibitions that have taken on the issue of digital labor explicitly. There was concern for the question if digital labor is in fact distinct from traditional forms of labor. For Paolo Virno, Maurizio Lazzarato, Tiziana Terranova, and Antonio Negri (and well, Marx) “to live is to labor.” Life itself is put to work; we are all becoming the standing leave of his or her for capital. The publication of the IPF book came out of that understanding, informed by Italian Operaismo, leading up to an intense fascination with the Facebook exploitation thesis. In retrospect, the idea that we are exploited on Facebook – that what we are doing there is labor in the sense of value creation – is not as urgent in terms of its content but it is still essential as provocation. It is a provocation that leads to an investigation of the digital labor surveillance complex and the instruments of value capture on the Post-Snowden web. The prolific Christian Fuchs has edited a collection of essays focusing in the definition of digital labor. Mark Andrejevic and Fuchs, in particular, have taken up the question of exploitation in the context of predictive analytics and data labor. Adam Arvidsson, also in his latest book The Ethical Economy: Rebuilding Value After the Crisis, offers counterpoints, claiming that value generation on social networking services is more truthiness than fact. Ethan Zuckerman’s recent rejection of online advertisement, published in The Atlantic, is part of this larger, very necessary debate about the staggering social costs of allegedly free social networking services. The debate around playbor and value capture took center stage for much of the past five years and it will also continue at #DL14. In the end surely, #DL14 will be about many things, and you decide what you take away from it. So, if you haven’t done so already, take out your pencil or boot up your calendar: join us at The New School in a few weeks, also to experiment with event formats a little bit.